“Fourteen, fifteen, sixteen, seventeen, lemme tell you. Those are big years. of your life—but it’s more than that. Sometimes your whole life happens in those years, and the rest of your life it’s just the same story playing out with different characters. We’ve all heard school reunion stories about the nerd who’s now a multi-millionaire, the wallflower who’s a network news anchor. And the flip side – the school jock, prom queen, or Romeo still waiting for the world to acknowledge their greatness. Believing the accolades bestowed on them would continue, they failed to grow beyond their adolescent day in the sun. Adolescence is a time of angst and accomplishment, tribulations and triumphs. 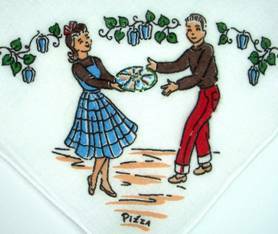 It’s a time of unprecedented growth, and these hankies remind us of the endless energy expended, while testing the boundaries of impending adulthood. Pranks were played, friendships forged, hearts broken, and lessons learned. For some, one rite of passage was The Prom. 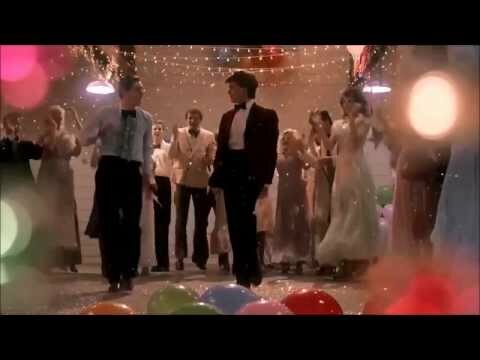 During prom season, we thought it fitting to revisit those adolescent days. 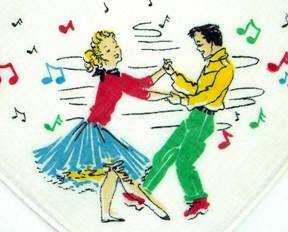 Whether be-bop, swing, jive, or rock and roll, these guys n’ gals are tearing up the dance floor. To best showcase your moves, you need a partner. This next enterprising lad, posse in tow, tries to coax a comely lass to join his crew. Note the jalopy graffiti “Don’t laugh mother. Your daughter may be inside.” Still, these bow tied boys in sports coats and letter sweaters seem gentlemanly. Will she succumb to his advances? Or hold out for the heartthrob quarterback? The style of his helmet denotes the era, while the mum corsage border affirms it’s homecoming. This scholar uses her study sessions to maximum advantage, with wise owls and books adorning every corner. But check the main image; she won’t be languishing in the library on Friday night. She’s snagged not one, but two admirers. Whether they’re seeking romance or a brilliant lab partner is unclear. What we do know is this shy gal is whip smart in more ways than one. How will Betty Co-ed signal to the beau who’s in favor? 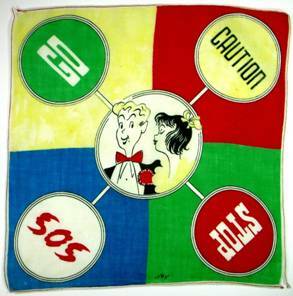 Perhaps this hankie will help. Carried so often, it’s worn and torn at the corners (I’m SO glad someone saved it). Note the tears appear at Stop and Go!! Did she dangle this from her pocket with the desired message displayed? Or did this little gem suffer a tug o’ war with a determined swain? A favorite outlet for pent up energy is the school dance. 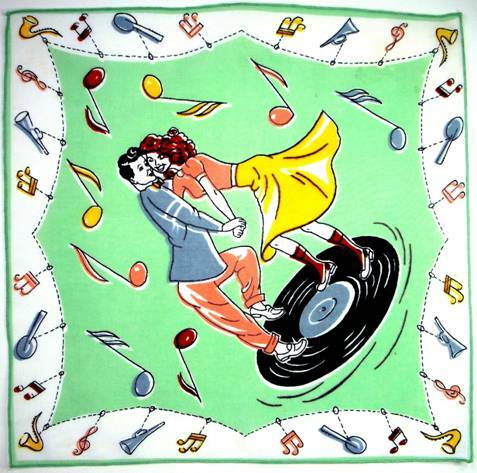 Whether it’s a formal affair with gowns and coat and tie, or a jitterbugging jive fest, these images in strong primary colors say “Let’s Party!” The vocabulary provides another hint that we’re in the 1940’s “Hey Corny, Let’s Pop!” “Hi Worm, Let’s Squirm!” “Let’s Whip, Cream!” And of course, the reference to “Platters” which are phonograph records. Only someone who lived through WWII would understand the import of this supposedly silly line. Yet volumes of history reside in that catchphrase. This was wartime. Sugar was rationed from 1942 to 1947, along with coffee, milk, cheese, meat, tires, cars, bicycles, gasoline, kerosene, fuel oil, typewriters and more. Families followed the adage “Use it up, wear it out, do with less, or do without.” And they did without – every man, woman, and child, to support a country they believed was worth the sacrifice. For a populace that routinely rents limos for their kids to attend prom, and camps on the sidewalk overnight to snap up the latest iphone, rationing is a foreign concept. I treasure this hankie – faded type, holes and all. It’s 70+ years old, and someone loved it enough to save it, which I doubt would happen in today’s replace-it-with-the-latest society. It truly is a page from history. Not every home had a phone, and chatting was a luxury for many. 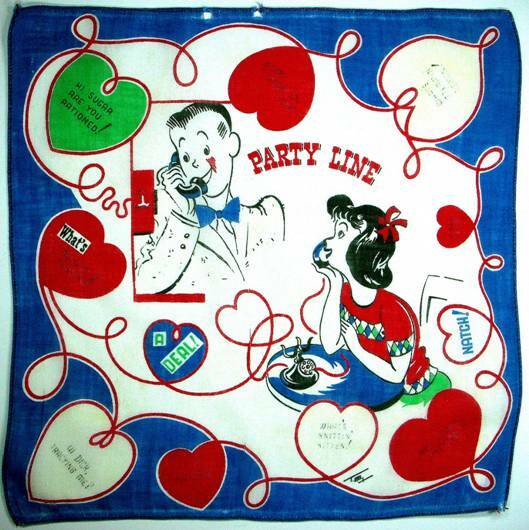 On the left, another 40’s hankie contains names popular to that era – Mable, Artie, Alice, Dorothy. Not a Brittany or Tiffany in the bunch. 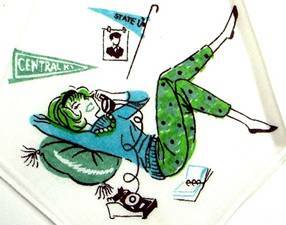 On the right, a gal from the 50’s lounges and chats in her capri length pants, known as pedal pushers. All images contain rotary phones (google it). Push button phones weren’t introduced until 1963; touch screen iphones appeared in 2007. 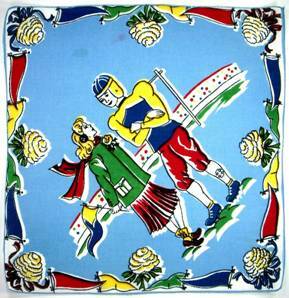 One image that lent itself to handkerchief borders was the ever popular charm bracelet. 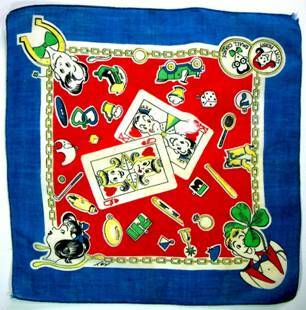 On the left, a plethora of good luck wishes – horseshoe, wishbone, four leaf clover, and lucky dice, encircle the King and Queen of Hearts. We also spy interlocking hearts, an engagement ring, and a baby cradle! 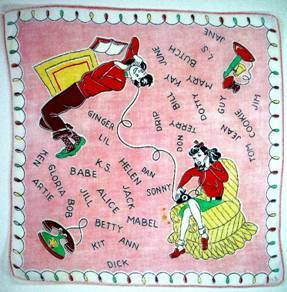 The trio spinning platters next door are also encircled by a bracelet with images of love, luck, and hobbies – tennis, piano, etc. The ultimate goal, of course, was to get that dream girl in your arms for a slow dance. Here’s your trivia tweet for the day. What are these things? Answer provided at the end of the blog. 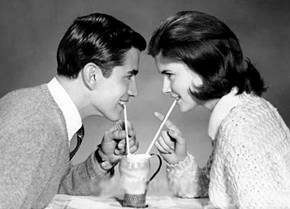 A great ploy for getting together was the malt shop. 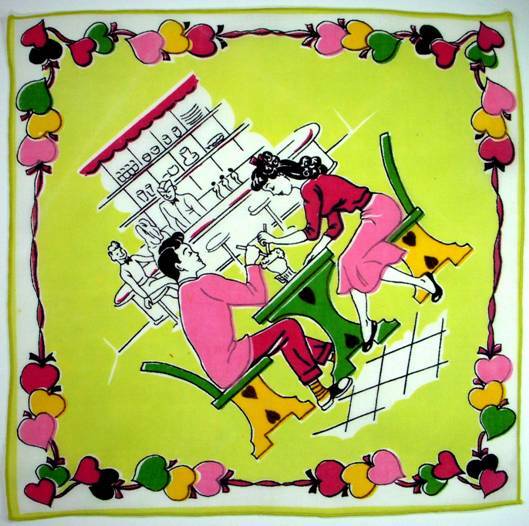 Her hairdo indicates this is probably a 40’s hankie. 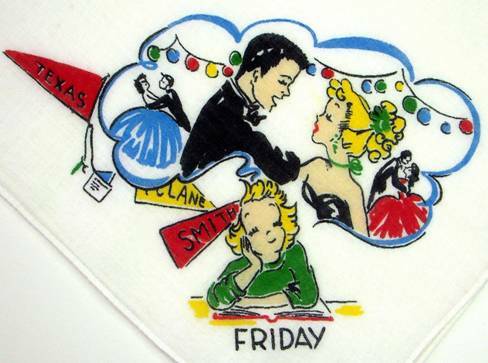 Note the jukebox in the hand embroidered hankie on the right. 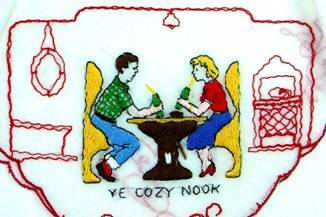 (This hankie is tiny and paper thin. 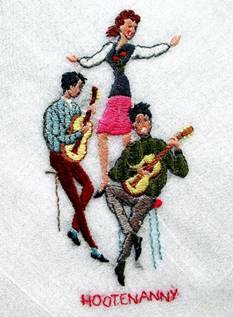 I can’t imagine trying to embroider the girl’s profile, which is perfect.) 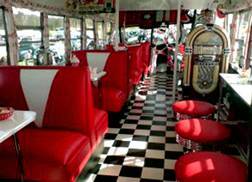 A romantic song playing on the jukebox could help set a romantic mood. 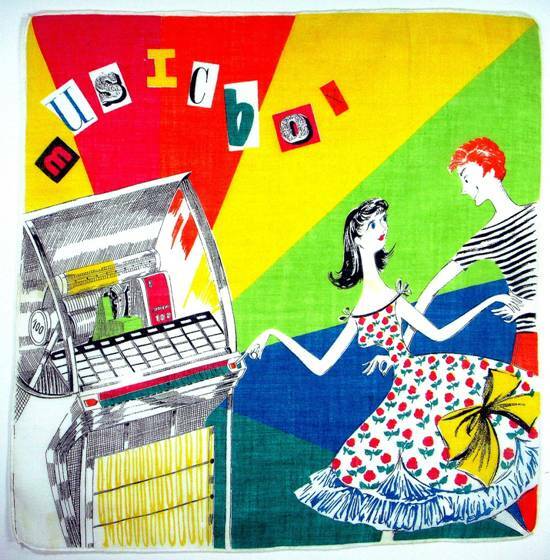 Jitterbuggers are bookended by the requisite staples for a good time – records and a jukebox. 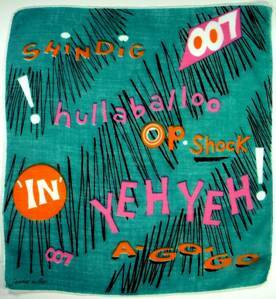 Vibrant colors enliven this hip, sophisticated hankie. 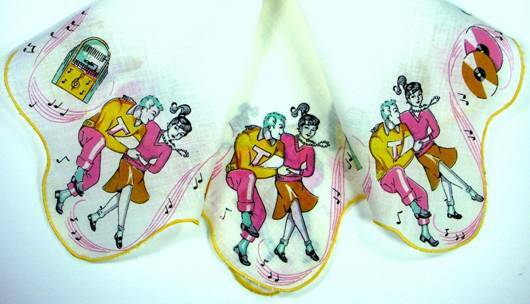 Dozens of hankies showcase couples twirling and twisting while music fills the air. Hoppin’ and boppin’ up a storm…at least until the pizza arrives. Girls home alone on a Friday night might daydream of future romantic dances once they got to college. 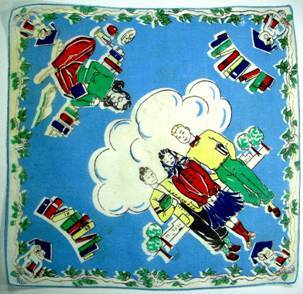 Day of the Week hankies were popular with children, teen and adults. 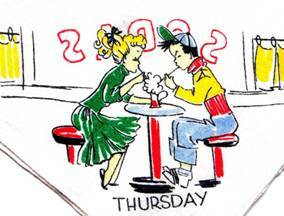 (Note the Thursday hankie at the soda shop.) Some featured daily chores to complete, while others depicted professions, and of course, teens had their own special daily tasks – i.e. soda shop, day dreaming, etc. 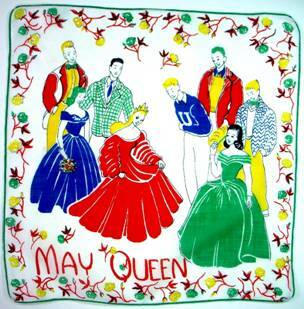 Shortly after the bobby sox, Elvis, and rock n’ roll phase of the 1950’s, there was a rise in folk music with Pete Seeger, the Kingston Trio, Peter Paul and Mary, and others. While the beat poets gathered to hear Jack Kerouac read On the Road and Allen Ginsberg read Howl, young adults convened in coffee houses to sing along at gatherings dubbed “Hootenannys” which often included an open mic. 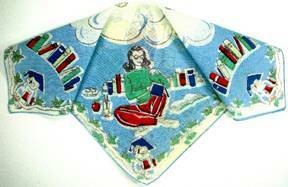 Yes, if you collect long enough, you’ll find a handkerchief that covers every topic! 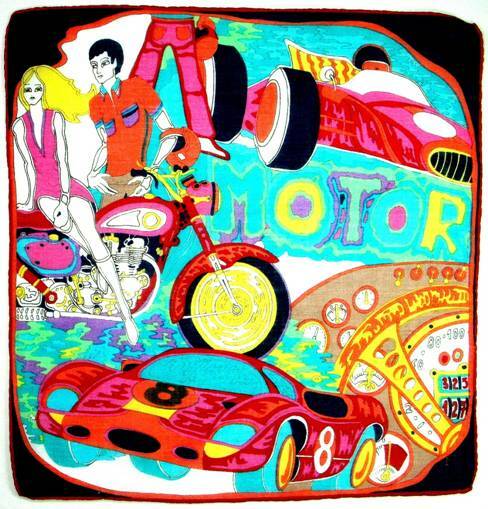 Great care was taken with the embroidery on this piece. How do you sustain that kind of energy? Practicing with the ever popular Hula Hoop helps! 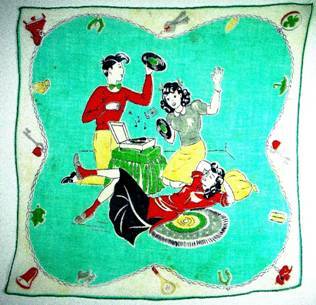 Hoops have appeared throughout history, from Egyptian culture to the Native American Hoop Dance, but they became a major fad in 1958 when Spud Melin and Richard Knerr, (those enterprising guys from Wham-O, who brought you the Frisbee – um, can you say billionaire?) introduced the hoop into popular culture. 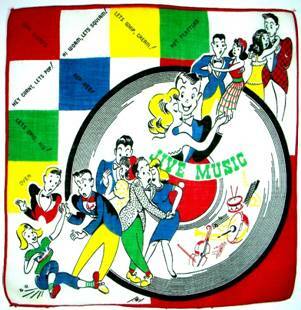 Sources claim they sold 25 million hoops in the first four months of 1958. By 1960, they had sold 100 million hoops. 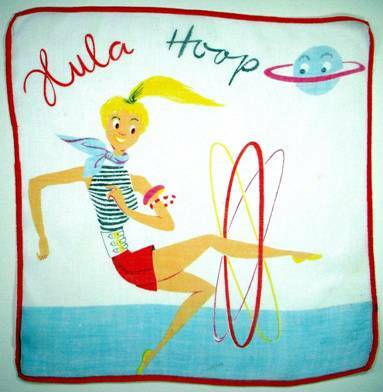 Hula hoops were even featured in the 1958 song “Christmas Don’t Be Late” by Alvin and the Chipmunks, which sold 4.5 million copies in seven weeks. This was half a century before the internet could take something viral. 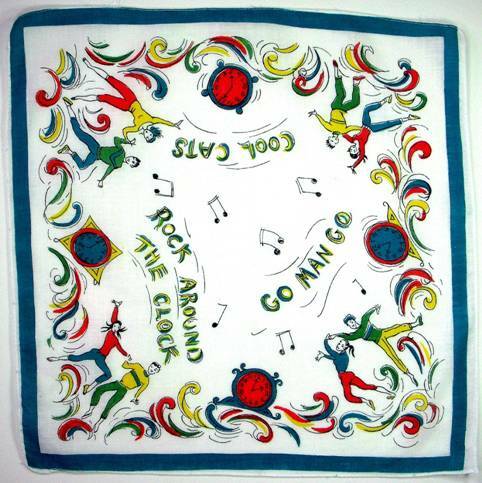 What goes with summer, hula hoops, and rock and roll? Hot rods, of course. We began this blog with a jalopy in the 1940’s and decades later, it still holds true – cars not only impressed the ladies, they represented independence, freedom and adventure, as you hit the open road. Getting a driver’s license was another milestone that underscored the fact you were now “grown up” if not yet quite an adult. 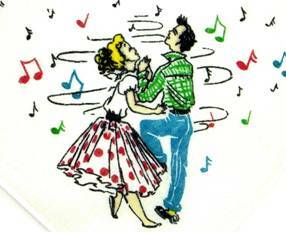 Songs about cars included “Mustang Sally,” “Little Deuce Coupe,” “Hot Rod Lincoln,” “GTO,” “409,” and of course “Fun, Fun, Fun” (‘Til Her Daddy Takes the T-Bird Away). Even into the 80s, Springsteen was singing “Pink Cadillac. The 1960’s ushered in tv shows like “Shindig” and “Hullabaloo”, where girls danced in white go-go boots. 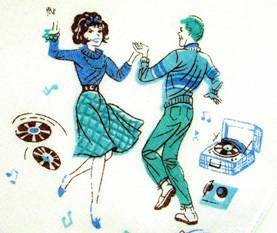 Discotheques like Whisky a Go-Go became popular, but the fad was short lived. English pop bands (The Beatles, The Rolling Stones, etc.) soon arrived and changed the vibe. 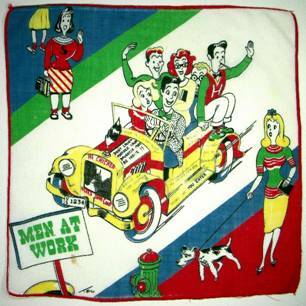 I was frankly astounded to find this hankie as neither show was on the air for more than two years. 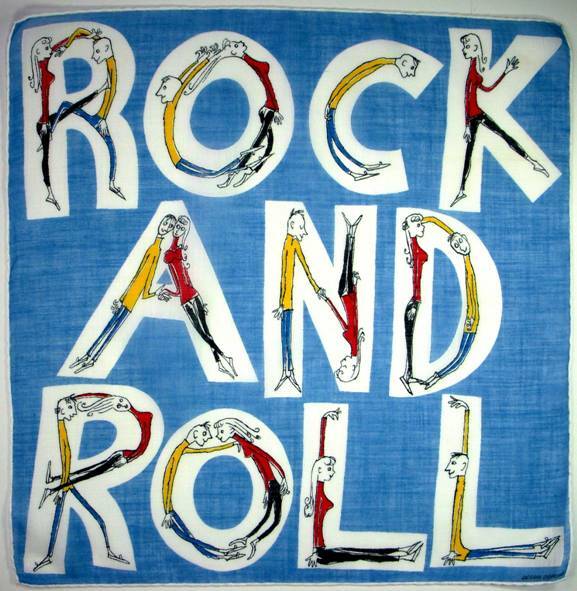 Since Rock & Roll is still going strong in one form or another, and is usually first embraced in adolescence, I decided to wrap with this fabulous number, particularly since only an adolescent physique could achieve most of these moves! when for the first time one faces life. Whether doing the hand jive (Grease), the mambo (West Side Story), or cutting Footloose, Prom is the night when hearts are broken and romances ignited. One seminal sequence – the dance off/into the pool scene from Its A Wonderful Life (1947) set the bar for all future proms. 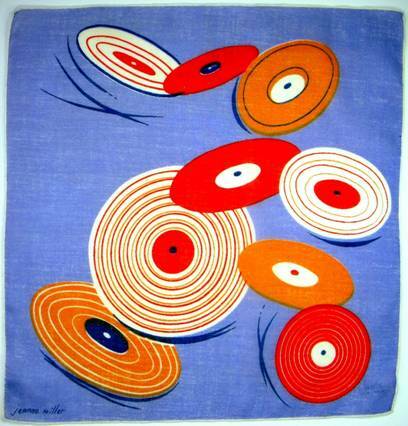 The images you saw above are center disks for 45 RPM records. Below, a record with a disk, and one without. 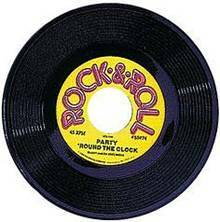 The 45 RPM record was developed by RCA in 1948, following the invention of vinyl. 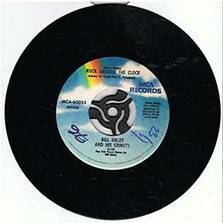 The records featured a single song on each side, and were an instant hit with teens who wanted the “hit of the week.” Turntables for the 45s contained a large center post, so records needed a large center opening to accommodate the post. 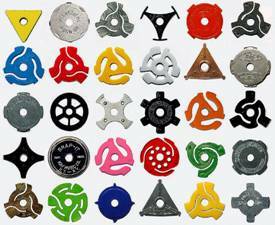 In order to play the 45’s on other turntables, an adaptor disk was created. 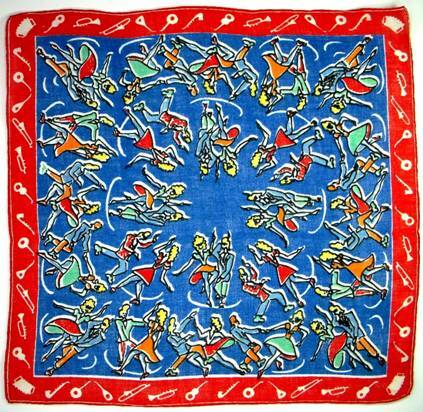 Like anything popular, it was soon offered in multiple styles and colors. As much as I hoped provide you with listening music, most rock & roll songs have lyrics, which I find distracting when I’m trying to read. (This assumes, of course, someone is actually reading this….) The rock instrumentals I found were horrible digitized soundtracks. In recompense, here is the playlist from the movie American Graffiti. Some are remakes of old standards, like Smoke Gets in Your Eyes, originally composed by Jerome Kern for the 1933 musical “Roberta,” or I Only Have Eyes for You, written by Harry Warren for the 1934 film “Dames.” This information is by no means meant to be a definitive guide to bop or rock and roll, but is merely provided as a guide to enhance your enjoyment of what was popular at the time. What a treat for a member of the class of ’55!